While architect Werner Sobek chose the name “active house,” a contrast to the passive house philosophy of efficiency and conservation, the incredible energy production achieved by the B10 wouldn’t be possible without a next-level envelope. Utilizing opaque surfaces and a vacuum-insulated, frameless glass front, the model home achieves a super-tight seal; the terrace even folds up to completely shield the home from sun when residents are gone. “When we started building these research homes in 2000, we were making passive homes, but have always wanted to get around the limits of small windows and lots of insulation and make something active,” says Sobek. The home is outfitted with Knoll furniture and kitchen furnishings by Leicht Küchen and Hansgrohe. A self-learning heating and power system inside the home utilizes a series of radio sensors inside and outside, as well as on the home’s electric cars, to constantly compare and learn, not only adjusting to temperature differences and behavioral patterns but forecasting them. If it’s going to be warm tomorrow, the home will anticipate when to stop heating the home and divert the overflow to the Le Corbusier building. Researchers at the University of Stuttgart studying the home have nearly nine months of data to work on, and after a family begins living in the home this spring, they’ll be able to improve the system’s performance with real-world data. As well as its energy efficiency the building offers important design innovations. B10 was planned and industrially prefabricated within a few months. It was then assembled on-site in just a day. The diverse constructive innovations of the building include, for example, the use of just 17 mm thick vacuum glazing in the form of a story-high glazed front. Other important innovations include the installation of a prefabricated technology rack with a central cable harness, fold-down façade elements (that fulfill a dual function as a patio), a fully recyclable timber-and-textile wall construction et cetera. Photo By Zooey Braun. To tour Stuttgart’s Weissenhof Estate, the site of the 1927 Deutscher Werkbund exhibition of prefab homes designed by modernist icons, is to walk through architecture’s future past. But within the housing estate, at Bruckmannweg 10, an ongoing research experiment will potentially shape architecture’s green future. The Active House B10, a prefab, glass-fronted box of a home built in a single day, features an energy management and production system that works on many more dimensions than its simple rectangular frame suggests. 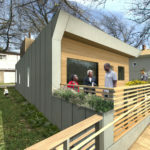 The super light, fully recyclable 970-square-foot building with a self-learning, self-regulating energy system generates 200% of its energy needs with a grid of photovoltaics on the roof. It’s literally a “power plant,” according to architect Werner Sobek, which will power a pair of electric cars and as well as a museum housed inside a Le Corbusier-designed building nearby. Sobek explained how the massive advances of B10 may shape the built environment for years to come. The surplus energy is used to power two electric cars and – utilizing smart grid technology – the neighboring house built by the architect Le Corbusier (home to the Weissenhof Museum since 2006). Photo By Zooey Braun.